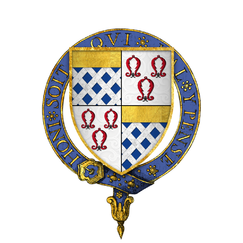 Sir Anthony St Leger, KG (or Sellenger; c. 1496 – 16 March 1559), of Ulcombe and Leeds Castle in Kent, was an English politician and Lord Deputy of Ireland during the Tudor period. Anthony St Leger was the eldest son of Ralph II St Leger of Ulcombe in Kent, by his wife Isabel (or Elizabeth) Haute. She was the daughter of Richard Haute (d. 8 April 1487) by his wife Elizabeth Tyrrell, widow of Sir Robert Darcy (c.1420 - 2 November 1469) of Maldon, Essex, and daughter of Sir Thomas Tyrrell (d. 28 March 1477) of Heron in the parish of East Horndon, Essex (son of John Tyrrell). He was educated abroad and at the University of Cambridge. He quickly gained the favour of King Henry VIII (1509–1547), and in 1537 was appointed president of a commission of enquiry into the condition of Ireland. In the course of this work, he obtained much useful knowledge of the country. In 1539, he was knighted and appointed Sheriff of Kent. On 7 July 1540, Sir Anthony was appointed Lord Deputy of Ireland and tasked with the repression of disorder. He moved against the MacMorrough-Kavanagh clan, who had long claimed the title of King of Leinster, permitting them to retain their lands only by accepting feudal tenure on the English model. By a similar policy, he exacted obedience from the O'Mores, O'Tooles and O'Conors in Leix and Offaly. Having conciliated the O'Briens in the west and the Earl of Desmond in the south, he obtained the passage of an act in the Irish Parliament in Dublin, which conferred the title of King of Ireland on King Henry VIII and his heirs. Conn O'Neill, who had remained sullenly hostile, was forced to submit. The policy was adopted and became known as "Surrender and regrant". St Leger's policy was generally one of moderation and conciliation, more so than Henry VIII wished. He recommended the head of the House of O'Brien, when he gave token of a submissive disposition, for the title of Earl of Thomond. O'Neill was created Earl of Tyrone. At St Leger's urging, the King in 1541 created six new Irish peerages. St Leger argued that the loyalty of the Anglo-Irish nobility could be better achieved "by small gifts and honest persuasion than by rigor", which seems to be an implicit criticism of the savage manner in which the Rebellion of Silken Thomas had been suppressed. St Leger's policy of conciliation seems to have been successful: in particular, the Plunkett family, who received the title of Baron Louth, became steadfast loyalists to the English Crown, as did the Fitzpatrick family, who received the title of Baron Upper Ossory. Barnaby Fitzpatrick, 2nd Baron Upper Ossory grew up at Henry VIII's court, and he was a beloved childhood friend of Henry's son, Edward VI. An administrative council was instituted in the province of Munster, and in 1544, a levy of Irish soldiers was raised for service in Henry VIII's wars. St Leger's personal influence was proved by an outbreak of disturbance when he visited England in 1544, and the prompt restoration of order upon his return some months later. St Leger retained his office under King Edward VI (1547–1553), and again effectively quelled attempts at rebellion by the O'Conors and O'Byrnes. From 1548 to 1550, Sir Anthony was in England and returned to Ireland charged with the duty of introducing the reformed liturgy into that island. His conciliatory methods led to his recall in the summer of 1551. After the accession of Queen Mary (1553–1558), he was again appointed Lord Deputy in October 1553, but a charge of keeping false accounts caused him to be recalled for the third time in 1556. He died while the accusation was still under investigation, by which time, in 1559, he had been elected Member of Parliament for Kent. Du noble et vailant chevalier mesier Antonye Sentleger Deputie pour la roy en son royalme d'Ierlond et une de la estroiet chamber du roy NRE (n(ot)re?) souverain SHR frere et compaignon de la tres noble Ordre de la Jarretiere ("Of the noble and valiant knight Sir Anthony St Ledger, deputy for the king in his kingdom of Ireland and one of the privy chamber of the king (our?) sovereign SHR? brother and companion of the most noble Order of the Garter"). The heraldry shows an escutcheon circumscribed by the Garter displaying the arms quarterly 1 & 4: Azure fretty argent (St Ledger); 2 & 3: Argent, three barnacles gules tied sable (Donet of Sileham, Rainham, Kent). Sir Anthony's great-grandfather Sir John St Leger (d.1442) of Ulcombe, married Margery Donet (or Donnet), daughter and heiress of James Donet (d.1409) of Sileham. His crest is shown as: A griffin statant (Crest of St Leger family, Viscount Doneraile: A griffin passant or (Debrett's Peerage, 1968, p. 365)) and his supporters: Two griffins wings elevated (supporters of St Leger family, Viscount Doneraile: Two griffins or wings elevated azure fretty argent (Debrett's Peerage, 1968, p. 365)). St Leger seems to have been a quarrelsome and unpopular man; certainly, he was on very bad terms with other leading figures in the Dublin administration, particularly John Alan, Lord Chancellor of Ireland, and George Browne, Archbishop of Dublin. Following complaints by St Leger, Alan was removed from office and although he was later reinstated, the two men found it impossible to work together. Archbishop Browne accused St. Leger of treasonable words, giving Alan as his source, but the charge came to nothing when Alan, surprisingly, refused to confirm the report. When St Leger gave high military command to James Butler, 9th Earl of Ormond, he was accused by allies of Alan's of deliberately doing this to endanger Ormond's life. Ormond's mysterious death from poisoning in London in 1546, with 16 of his household, when he went to dinner in the Ely Palace was, at the least, extremely convenient for St Leger, although there is no direct evidence that he was responsible for it (mainly because there was no investigation, despite Ormond's wealth and social standing). As well as having inherited the paternal estate of Ulcombe, the St Leger family's seat from the 11th century, in 1552, he was granted possession of Leeds Castle in Kent, of which his grandfather Ralph I St Leger (d.1470) had been constable. William St Leger, who predeceased his father, albeit having left a son Sir Warham St Leger (d. 1600), whose own son was William St Leger (d. 1642), President of Munster. Anthony St Leger, Master of the Rolls in Ireland in 1593; some sources however describe him as a nephew rather than a son of Sir Anthony. ^ Richardson III 2011, pp. 216-17, 481. ^ Robertson & 1893–95, pp. 70-1. ^ "Sentleger, Anthony (SNTR496A)". A Cambridge Alumni Database. University of Cambridge. ^ "ST. LEGER (SELLENGER), Sir Anthony (c.1496-1559), of Ulcombe and Leeds Castle, Kent". History of Parliament Online. Retrieved 2012-05-09. Richardson, Douglas (2011). Everingham, Kimball G., ed. Magna Carta Ancestry: A Study in Colonial and Medieval Families. III (2nd ed.). Salt Lake City. pp. 216–17, 481. ISBN 144996639X. Robertson, Herbert (1893–95). Stemmata Robertson et Durdin. London: Mitchell and Hughes. pp. 70–1. ISBN 978 1 84383 614 8. Retrieved 29 July 2013. Dunlop, Robert (1897). "St. Leger, Anthony" . In Lee, Sidney. Dictionary of National Biography. 50. London: Smith, Elder & Co. This article incorporates text from a publication now in the public domain: Chisholm, Hugh, ed. (1911). "St Leger, Sir Anthony" . Encyclopædia Britannica. 24 (11th ed.). Cambridge University Press. Calendar of State Papers relating to Ireland, Hen. VIII-Eliz. Calendar of Letters and Papers of the Reign of Henry VIII. JA Froude, History of England (12 vols., London, 1856–1870). History of the Irish Confederation and the War in Ireland, edited by J. T. Gilbert (Dublin, 1882–1891).